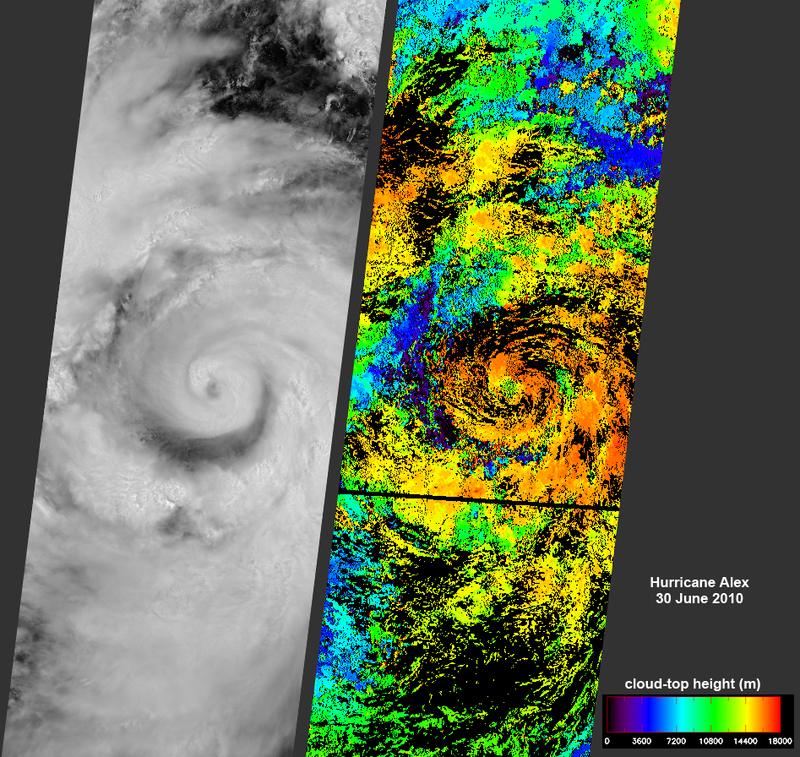 This view of Hurricane Alex in the western Gulf of Mexico was acquired by the Multi-angle Imaging SpectroRadiometer (MISR) instrument aboard NASA's Terra satellite just after noon Central Daylight Time on June 30, 2010. Around this time NOAA's National Hurricane Center reported Alex to be a strengthening Category 1 hurricane with maximum sustained winds of 135 kilometers per hour (84 miles per hour). By 6 p.m. Central time, Alex had been upgraded to Category 2, with maximum sustained winds of 155 kilometers per hour (nearly 100 miles per hour). The storm made landfall in northeastern Mexico, just south of the Texas border, about three hours later. High winds and rough seas further north in the Gulf halted cleanup efforts associated with the Deepwater Horizon oil spill. The two panels in Figure 1 shows a nadir (vertical-viewing) camera image of the hurricane on the left, and a map of cloud-top heights on the right. The heights are derived using automated stereo processing of the imagery from cameras pointed at different view angles. North is at the top. Each panel covers an area about 376 kilometers (234 miles) wide by 986 kilometers (613 miles) long. 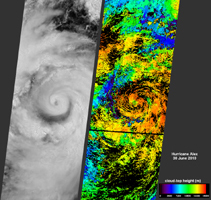 The height contrast between the clouds in the lower part of the atmosphere and the high clouds surrounding the hurricane's eye is dramatically seen in Figure 2, which is a stereo anaglyph of a portion of the scene, created from MISR's nadir and 26-degree forward-viewing cameras, and displayed at four times finer spatial resolution than Figure 1. In this image, north is at the left. Viewing with red/blue glasses (red filter over left eye) is required to obtain the 3-D effect. The dimensions of this image are 455 by 325 kilometers (283 by 202 miles).